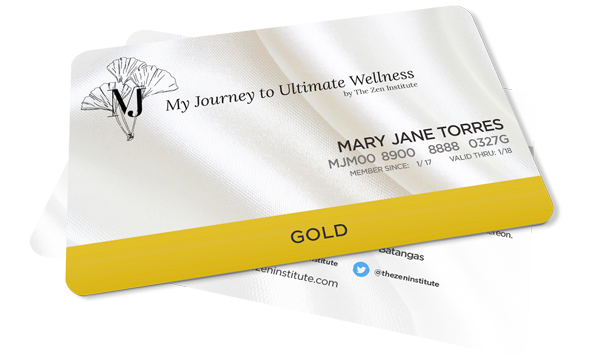 My Journey to Ultimate Wellness was created to motivate individuals to proactively take responsibility for their well-being. At The Zen Institute, our client’s well-being takes center stage . Understanding why and how aging plays out in the quality of life and what can be done about it is the first step towards empowerment to well-being. My Journey to Ultimate Wellness provides access to customized programs for preventive care, wellness education, and preferred rates at all Zen Institute branches and partner establishments. Any purchase of My Journey entry-level package worth 25,000 entitles the buyer to an automatic Silver membership. Fifteen Percent (7%) Discount on all Spa and Medical Treatments. Fifteen Percent (15%) Discount on all Spa and Medical Treatments. Every One hundred Pesos spent (P100.00) member earn One (1) point. One (1) point is equivalent to One (1) Peso Value. The membership card must be presented for payment to earn points. The membership card may only be used by the person to whom it was issued. It is not transferable. Earned points can be claimed only during the transaction. Points earned and the equivalent peso value are instantly updated in the system every time a purchase is made. Purchases of Gift Certificates with cash or credit card will be awarded points. Purchases using Gift Certificate as payment shall earn no point. Points will be applied after discount and taxes. Membership Card in not transferable. Each member will be issued with a membership card and a number. The use of the card and associated benefits privileges are deemed to be an acceptance of and subject to these Terms and Conditions. Peso Value, benefits and privileges of a member are non- transferable. Peso Value is redeemable for services exclusively at all Zen branches. Should Zen rewards program be cancelled, the remaining peso value must be used within 90 days from the date of cancellation. Remaining point’s equivalent to less than One Hundred (P100.00) peso value shall be cancelled. Prior reservations of at least three (3) days is required, subject to availability. Client needs to specify preferred date and time, and the services/s to be availed. Bring Membership Card when availing any of services. The membership card is valid for One (1) year from date of purchase. Points earned by cardholders who do not redeem within Three (3) months from expiry/termination date will be forfeited. Members must report the loss of the membership card immediately. Zen will not be held liable for any lost or stolen card or any transactions made thereon. Zen will replace lost or stolen cards with valid photo identification. A fee of PHP 500.00 will be charged for replacement card. Points accumulated on the lost card will be transferred to the new card. The Zen Institute Center for a free consultation with our team of experts.